In case you missed it, Amy Poehler's new autobiography, Yes Please , has already been making headlines — mainly because no one can wait for its release on October 28. But an excerpt released by Poehler's publisher last week has also been getting some attention for unexpected reasons. The preview is less what we've come to expect from Poehler — feminism/Pawnee/why she doesn't just marry Tina Fey — and more about the harder stuff in life. In the excerpt, everyone's favorite girl-crush admits to taking drugs — and is deeply honest about what it was like, both the good and bad. Poehler reveals she's done the gamut of recreational drugs: cocaine, "which I instantly love[d] but eventually hated," ecstasy, pot, and mushrooms. Crucially, Poehler's anecdotes are balanced and honest. She recounts the highs (a "wonderful" New Year's Party while high on E) and the lows (the day after, "when I thought I had no friends, and I was so sad I wanted to sink into the carpet and permanently live there"). 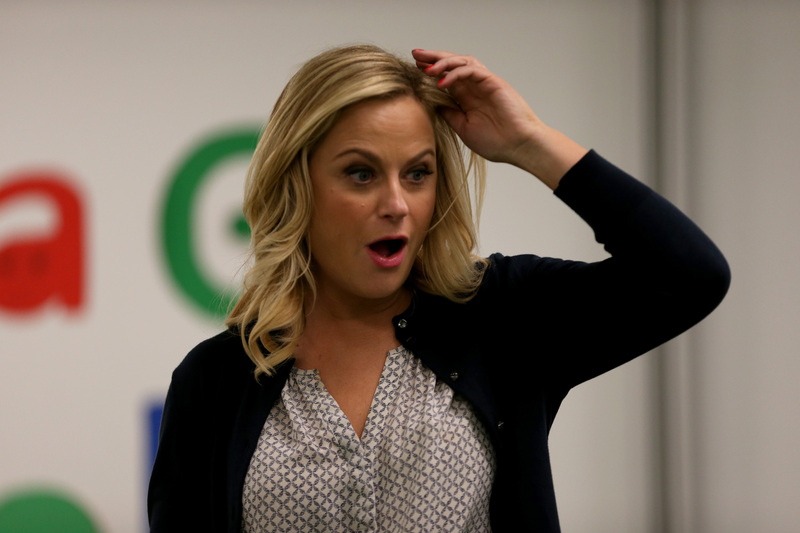 Gossip blogs responded pretty much as expected, with Celebitchy calling the revelation"sad" and others wondering how the admission would affect Poehler's "squeaky clean" reputation. Was Poehler, a mother of two, irresponsible, immoral, or stupid to talk about her past drug use without using the opportunity to hammer home an obvious "Drugs Are Bad" message? A woman like Amy Poehler adding her voice to this conversation is a massive plus: 9 million women in the U.S. alone use illegal drugs every year, and the non-abusers need to start sharing their experiences, too. If you missed this whole "scandal," then perhaps that's because it isn't much of a scandal at all. This is no TMZ special "scoop" complete with grainy photos of Poehler snorting coke off Neil Patrick Harris' crack. Poehler herself is controlling the conversation. And as far as revelations go, this is hardly up there with Angelina Jolie telling The Mirror that heroin was "her favorite" in 1996. Poehler's recollections of her drug use are much more mundane: She stopped using most drugs because the boring, depressing come-down days were stopping her from having fun with her children when she was hungover. That's what makes these confessions special — because conversations about drug use really need to be honest, about both the highs and the lows. Still, it's a very interesting segment for Poehler to release. She could have chosen a paragraph on whether Will Arnett ever left fake tan on the bath towels, or how she's planning to run for president. But she didn't. Poehler, a prominent woman who's built her career on intelligence and quick-fire wit, wanted to talk about the drugs she's experienced in her life, in a balanced way. Why is that valuable? Because with all the Craziest Celebrity Drug Stories and Amy Winehouse specials, the realities of common drug experiences are all-too-rarely covered by the media or television. Breaking Bad, The Wire, and Shameless brought the heartbreak of addiction and the realities of drug industries into our living rooms, and anybody who's ever seen Requiem for a Dream will run screaming if they so much as see a needle. On the other side, we have the happy, shiny proponents, the Snoop Doggs of the world, who seem to live in a perpetual pot haze and (aside from weird feuds with Iggy Azalea) make some drugs, at least, seem pretty benign and comical, if addictive. But Poehler's confessions don't fit either of these models. For one, they're realistic about the appeal of certain drugs. Poehler declares that cocaine is good for specific things, like "if you want to hang out with people you don’t know very well and play Ping-Pong all night." She also says, frankly, that mushrooms teach great, if retrospectively silly, lessons: "Everyone needs love, never hurt a living thing, don’t worry about the choices you make because everything will be fun because life is a closet filled with pool toys." And, crucially, her decision to cut back on drug use wasn't because she feared she was setting a poor example to her fans, or feared addiction. It was because it impeded her two main priorities, hanging out with her sons and her work: "I can’t perform, drive or write stoned, and therefore I smoke pot a lot less than I used to." But Poehler also hasn't forgotten the importance of representing women's actual experiences in comedy — lest we forget, she is the producer behind everyone's favorite (and pretty much only) female stoner sitcom, Broad City . The importance of this sort of balanced, nuanced honesty when it comes to drugs is starting to catch on. The Global Commission on Drugs Policy launched a new campaign this year, We Need to Talk About Drugs, which emphasizes that talking openly about drug use, its appeal, and its costs without exaggeration should be a huge priority. Even anti-drug organizations seem to be acknowledging that individuals can make informed decisions about what they want to do with their bodies and their lives. A woman like Amy Poehler adding her voice to this conversation is a massive plus: 9 million women in the U.S. alone use illegal drugs every year, and the non-abusers need to start sharing their experiences too. Poehler is not famous for being a party girl or hosting huge ragers. She has two kids, a hugely successful career, and certainly doesn't spend her time stumbling out of clubs yelling at the paparazzi. She did drugs with fellow adult friends, in private, and at house parties — and that's a very common slice of the modern drug experience which is rarely spoken about, unless it ends in accident or disaster. We need to be better at discussing drug use in all its forms — especially as women. Poehler's telling us the whole, unvarnished story, and proving, once again, that she's just as cool as we imagined.